The S&P 500 is now up 6% over the last six trading sessions. 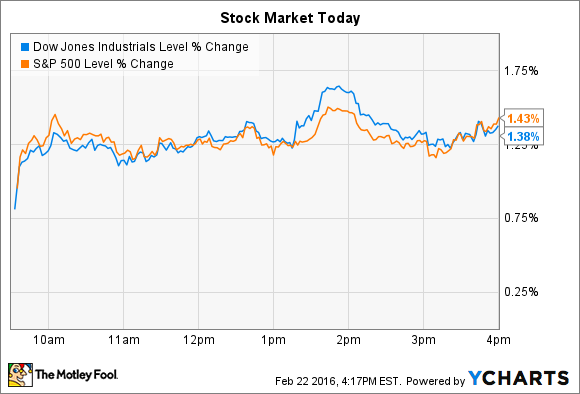 Stocks logged a strong trading session today, with both major indexes enjoying broad gains. The Dow Jones Industrial Average (DJINDICES:^DJI) added 229 points, or 1.4%, and the S&P 500 (SNPINDEX:^GSPC) rose by 28 points, or 1.4%. Both indexes are up better than 6 percentage points over the past six trading days. In economic news, oil prices jumped 6% higher after the International Energy Agency projected that daily shale oil production in the U.S. will decline by 600,000 barrels this year and by 200,000 barrels in 2017 on its way to reaching global supply and demand balance next year. As a result, energy was today's best-performing sector. Meanwhile, individual stocks on the move included Amazon.com (NASDAQ:AMZN) and Sysco (NYSE:SYY). Amazon's stock spiked 4% higher today, which brought its gain to 15% since touching a low of $475 per share in early February. Shares are still about 20% of their $700 all-time high set in December, however. Today's jump came after the e-commerce giant adopted a stingier free shipping policy by boosting the required minimum spending per order up to $49 from the previous $35. As a result, more shoppers will end up paying for shipping, adding extra items to get orders to qualify for free shipping, or signing up for a Prime membership. Each of those scenarios is a win from Amazon's business perspective. Shipping costs are a major drag on earnings. Last year, they amounted to $5 billion, or 5.1% of Amazon's sales, up from $4.2 billion, or 5% of sales in 2014. That's why even a small move by the retailer to charge higher prices for shipping could have an outsized effect on its earnings potential. Yet investors shouldn't look at this move as a sign that Amazon is shifting its focus toward profit maximization. As management explains in the 10-K report, "We believe that offering low prices to our customers is fundamental to our future success, and one way we offer lower prices is through shipping offers." It's likely that the company is just seeking to recover some of the increasing costs of providing quick delivery to customers. Foodservice giant Sysco's shares fell 5% after it announced an expensive acquisition this morning. The company struck a deal to purchase privately owned Brakes Group, a European foodservice distributor, for $3.1 billion. Brakes' business will likely be a good fit with Sysco's. It serves food to thousands of customers across Europe every day, including hospitals, restaurants, and schools. The company's 2015 fiscal year was solid, with $5 billion of sales, or 6% above the prior-year period. "This transaction will unite Sysco with a leading foodservice distributor in Europe with demonstrated capability to sustainably grow its business over time," CEO Bill DeLaney said in a press release. The purchase will provide an immediate boost to earnings starting in fiscal, 2017, the company said. Wall Street might not be happy about the price tag, though. Sysco will need to take on new debt to finance this $3 billion transaction, which values the tiny European company at the same earnings multiple as Sysco's. Executives assured investors that the purchase won't change Sysco's capital allocation policy, though. "We remain committed to reinvesting in our business, growing our dividend, expanding our business through strategic acquisition and repurchasing shares opportunistically," DeLaney said.